It’s been quite a while since Nintendo’s hungry pink puffball last saw a console outing, Kirby’s well known for his various escapades on DS, and his fighting skills in Smash Bros. Brawl, but he’s not seen a proper home console adventure since Kirby 64 at the start of the century. So this adventure has been a long time coming, though it’s not the usual Kirby fare. The story goes that there’s a new villain going about, Yin-Yarn, whom has a magical staff with which he can turn people into yarn. Kirby notices a Metamato (a power-up item in the series) and tries to eat it, only to find it belongs to the evil sorcerer. 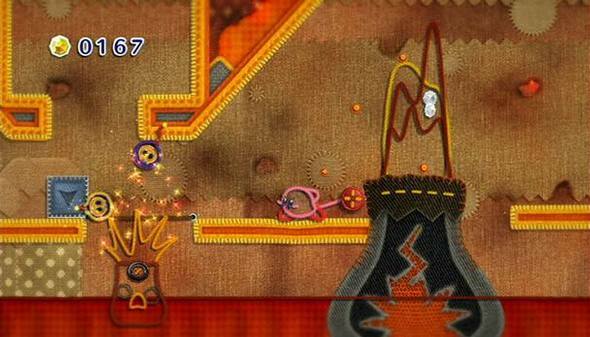 He turns Kirby into yarn and he finds himself in a strange land made of patch quilts, sting, and cloth. He also runs into Prince Fluff, ruler of the quilted kingdom, it turns out Yin-Yarn has split the kingdom apart and Fluff needs help to stitch his kingdom back together. This time Kirby isn’t alone on this adventure too, it turns out Prince Fluff shares a lot of Kirby’s abilities and can tag along to help him on his quest. This also means there is a co-operative 2 player mode also! 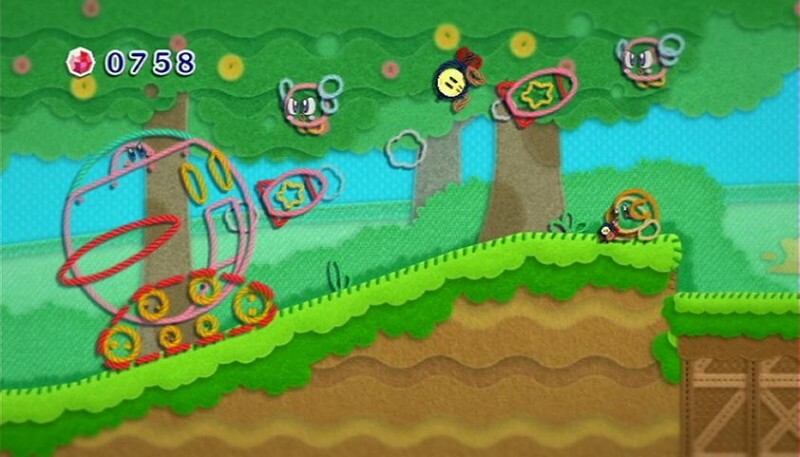 Kirby and Fluff can help each other explores the various levels (and mess about, as you can both catch and toss each other about) and also take dual controls on the big machine transformations. Thankfully for those concerned about playing with novice players, there are no lives to be lost and so dying won’t end the game, instead, dying simply means you lose a number of “beads”, the local currency in Fluff’s world. There are also a number of goodies to find as you explore each level, these items range from unlockable music and extras to themed furniture that can be used to furnish Kirby’s temporary abode. Outside the levels, there are main hubs for each segment of the world, and a large main area with miscellaneous stuff. From here, the music picked up during levels can be played, cut scenes can be watched again, and various game options tweaked. There is also an apartment complex that early on, Kirby gains his own room from. This room can be furnished with items found in the levels, and other characters soon make homes there too, hosting challenges and time attack races that Kirby & Prince Fluff can participate in. The house decoration idea is a nice little timewaster that gives you some time to relax and bask in the outright adorable nature of this game. It’s a shame there isn’t an awful lot of interactivity with the items, though you do get some fun surprises with a few. Overall, this is video game equivalent of a cute, fluffy kitten; Epic Yarn is unashamedly adorable and flouts it at every opportunity. If the setting doesn’t get you, Kirby’s transformations and adorable yelps will. The cut scenes are set out like a picture book (complete with pleasant sounding narrator) and the music all has a relaxing lullaby quality to it (with exception of maybe boss themes). The game itself is also quite easy, so it becomes quite a relaxing experience, this may not sit well with some gamers, but it you’re looking for something pleasant after a frustratingly hard game, this is the perfect detox. Though there are challanges and the game does have medal rankings for each level (which depends on how many beads you managed to pick up). This game is also by far the best co-op multi-player for beginners, or expert players trying to introduce beginners into gaming, so if you’re a parent looking to share some gaming experience with your kid, this is an ideal place to start! 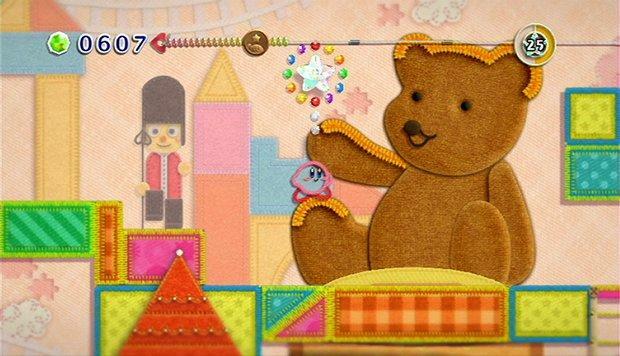 All in all, if you can stand the amount of cute this game peddles at you and fancy something relaxing, then give Kirby a whirl. Previous Previous post: Embrace gadgets, but don’t forget your pens and paper!